10% table foods, grains, cereal, bread, pasta ,cheese, eggs, meat etc. Fresh drinking water changed 3-5 times daily. This type of diet offers cockatiels a healthy variety of foods. However, cockatiels are once again given the choice to pick and choose, often choosing the less nutritious foods over the nutritious ones. Birds have neither the intelligence not the instinct to choose healthy foods for themselves. Birds do have taste buds and they will choose what they like the best. Foods higher in fat content taste better. You are also responsible for preparing 50% of your cockatiel's daily food intake. 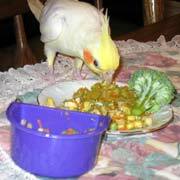 If your cockatiel is being served this type of food in his/her cage, the cage, water and food dishes must be kept especially clean to avoid the bird from eating spoiled or moldy food and to prevent harmful bacterial growth. Drinking water will have to be replaced more often each day as well. Also, 50% of your bird's daily food has the potential to become contaminated when at room temperature. Fresh foods should be removed after 2 hours. Ideally, cockatiels should be offered a combination of these fresh foods 3 times a day with nutritious snacks between meals. (This is the most recent type of diet that Mama and Cookie were switched to). A small to moderate amount of seeds each day. Fresh drinking water changed 2-3 times daily. Percentages of seeds, pellets and table foods recommendations will vary among avian vets. Some vets recommend a higher percentage of pellets while others prefer a more natural approach with more fresh foods and equal amounts of pellet and seeds. UC-Davis began research on cockatiels to determine the best diets and to compare different nutrients among them. Avian nutritionists have taken data from this and have created pellet or formulated diets for birds. Pellets are a manufactured mix of as many as 40 different concentrated nutrients which have been mashed and formed into shapes. 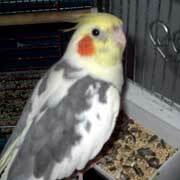 Pellets provide almost every essential element needed by a cockatiel for a balanced diet, with the exception of a cuttlebone for calcium and a cuttlebone. The protein content varies by brand name but ranges between 12%-14 % with a 4%-5% fat content. Providing your bird with fresh food, such as fruits, vegetables and a small amount of daily seeds, will add variety to your bird's diet and it can prevent liver and kidney disease which some birds are genetically prone to. Your bird will also receive the benefits from the different nutrients contained in each food and most avian veterinarians in the USA recommend that a pellet based diet be substituted for the all seed or a seed based diet. The recommended ratio of pellets/fresh foods/seeds varies among individual avian vets. Mama and Cookie received about 60% pellets and 40% fresh vegetables, cooked grains, other nutritious table foods and a small amount of seeds each day. Their ratio of pellets to fresh foods is different than it was 8 years ago, with less pellets and more table foods. Research on all avian diets is on-going and many avian vets now think that the inclusion of more fresh foods provide better nutrition. According to research results published by UC-Davis, (Jan.2001) healthy cockatiels on a high protein diet do not develop kidney disease. Cockatiels were fed high protein diets ranging between 11% to 20%. The results indicated that "A high protein diet is only harmful to cockatiels with underlying, (an undiagnosed) kidney disease." Kidney disease can go unrecognized for years, without clinical signs, when a cockatiel's diet is low in protein. Birds that already have a pre-existing kidney problem are more likely to show symptoms of their kidney disease when fed a high protein diet. Kidney disease is more frequently reported in color mutation cockatiels, especially "Lines that have been developed through much inbreeding". The report also states that the exact amount of protein required for maintenance in adult cockatiels has not yet been determined. Current literature suggests that it is about 12%. Manufacturers of pellets have now adjusted and lowered protein rates in formulations to reflect this requirement. 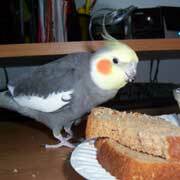 Choosing a Diet Changing your bird's diet should not be done without consulting your avian vet. All birds should have a yearly check up which includes blood testing. Your avian vet will help you choose a diet based on test results, physical findings, factors such as your bird's current age, weight, activity level, general health, what foods are available where you live, how well your bird accepts new foods and how much time you can devote to meeting the nutritional needs of your bird. According to UC-Davis, the diet of a new bird will also depend on what it was fed by the previous owners. Cockatiels respond favorably to what is familiar. Changing your bird's diet can be frustrating for both you and your feathered companion. You're avian vet knows this and he/she will help you to guide your bird through the process safely. Vitamin Supplements should not be given to birds on a pellet based diet. This can cause vitamin and mineral overdose toxicity, resulting in the same type of health problems as a vitamin deficiency. Birds that are on seed based diets should receive vitamin supplements. Choose a powder that you can sprinkle over food or a treat type vitamin. 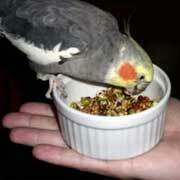 Adding vitamins to a bird's drinking water causes bacteria to grow on the bottom of the dish. That's why the water dish feels so slimy on the bottom after a few hours. Vitamins that are put into water are also flavor enhanced. This changes the flavor of a bird's drinking water and may cause some birds to drink less water. Vitamins also loose their potency and disintegrate in water. Thank you to all who shared photos of their birds with us!